I am just going to start at the beginning and start going through our activities of the past few weeks in chronological order...... I'll write now and add pics as I get time to upload them, so if you are reading this and there are no pictures, check back in a few days. We are blessed and delighted to have my parents here for the holidays this year. They flew into ATL on December 20, just a 1/2 hour late or so, despite weather-related weirdness spanning MOST of the country. We were all praying for that between freakish storms and holiday crowds and considered it a blessing that there were no real issues in their trip. They had a bit of a stressful connection in Denver, where my usually calm Dad nearly had a freak out from the sounds of things.....despite his telling my Mom to relax and just go where the wind blew them all day! And then NATURALLY their bags did not make it on the same flight they did. They were delivered the next day to our house, so all in all not too bad. 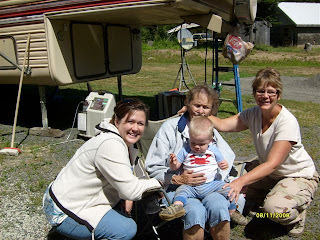 We were sort of tentatively planning to get Jaydan baptized while Granny and Grampa were here, pending Jeff's schedule with his new job. It all ended up working out for us to be able to proceed on the 21st. My parents and Jeff's were able to attend, which was important to us. Jaydan did not disappoint...... as the Pastor went to sprinkle the water on his head he screamed, "NO, NO, NO". And the church we recently joined has a tradition of carrying the child around the congregation while they sing a sweet little song to the baby. Of course, he screamed the whole time only stopping to check out a very cute little redhead in the crowd!!! This blog may NOT have pics b/c we were so stressed out by his "performance" that we simply didn't think to get any! I've been terrible about blogging these past few weeks...... we've just been so darn busy!!!! We thoroughly enjoyed visiting with Rashell.... it went way too fast, as usual. The next weekend we loaded up an d headed to Florida to spend and early "Thanksgiving" with Jeff's grandparents and extended family. That was lots of fun and Jaydan got to meet his new baby cousin, who he liked just fine...... unless his Mama was holding him! MawMaw and Grandaddy's house is always lots of fun and Jaydan has a truly special relationship with both of them and Jeff's Aunt Gayle. I got some fun pics but haven't had time to upload them, so you'll have to stay tuned for the visual aids. For "real" Thanksgiving we went to Jeff's parents. They only live about 20 minutes or so from us, whi ch is great and they have a beautiful home on a beautiful lake, which is even better. His sister's couldn't make this trip, so it was just us. It was much quieter than usual and we missed them a lot and can't wait to see them at Christmas! It was a very relaxing long weekend. 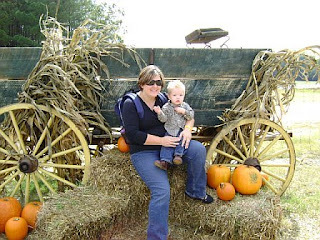 Jaydan and I packed up and headed home Saturday after the football game (GO Gators!!!) and I was up late that night and busy all day on Sunday putting up the Christmas decorations. Its a lot of fun having a toddler for the holidays........ it kind of reminds you how magical it all is. He was a lot of "help", as you can imagine. I bought a box of shatterproof ornaments and he carried them from the box to the tree, where he proceeded to stuff about 17 balls into one little space in the tree. It kept him busy and he was quick to tell anyone who would listen that it's "HIS" tree and that he was making it "pitty". He's picking up new works like crazy right now.... some of the latest are: "move" (as in, get out of my way), bwok (block), fwuit (fruit), shoes, and on occasion he actually says the word "please" instead of the usual "heeth". The time out thing seems to be working pretty well. There are even times now that Jaydan will do something that he knows earns a time out, look right at us, and just take himself to the time out rug without us having to even say anything. He stomps over and plops himself down and wails..... just like we told him to go!!! It seems to help a lot for him to just have a few moments of no stimulations to get himself back under control. Here is the issue we are having now (he TOTALLY gets this from his Dad). We make him hug us to say "sorry" before he can get out...... that's when we talk about why he got put there, etc. That child would rather sit in the corner for 30 minutes than apologize!!! Often, he ends up setting for two or three more "sessions" before he will finally give in and give you a hug. Lord help us!!! Jaydan and I picked Rashell up from the airport Saturday afternoon. She came prepared with gummy bears, so Jaydan was easily won over! He had fun and was pretty cute showing off for her.....all those gummy bears make a boy hyper, so he was in rare form! We were pretty lazy, just visiting and enjoying getting to catch up. We brought her down to her hotel on Sunday and hung out there for a little while and helped her settle in (Jaydan is a ton of help, you can imagine). Tonight I am staying w/ her downtown for some girl time. We are going to go somewhere nice for dinner and enjoy being grown ups!!! I am ashamed to admit that I failed to get any pictures of her playing with Jaydan this time!!! I don't know what I was thinking! Hopefully we'll get some tonight but I regret that I won't have any of the two of them together from this trip. We get to see Shee-eeeell!! 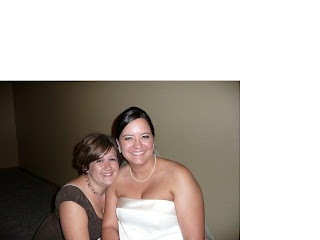 My cousin Rashell is flying into Atlanta tomorrow and we are SOOOOOO excited!!! We haven't seen her since Kyle's wedding in May and I am really looking forward to it. 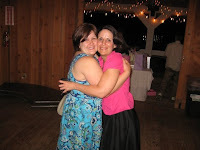 We were raised very close to these cousins and really, they are more like siblings than cousins and Shell and I have gotten into lots of trouble together over the years! Rashell, we will see you tomorrow! We had a nice, quiet weekend at home. Jaydan is at an age where he is "testing" us quite a bit. Sometimes, its such a surprise when such an ugly "NO" comes out of that sweet little mouth. We have decided to try time-out, since that seems to hurt his heart more than a swat hurts his bottom. We'll keep you posted and we are open to suggestions from any of you who are parents of hard-headed kids! I took him to the park at our church on Saturday.....he's able to climb the first several stairs, situate himself, and launch himself down the little slide by himself now. Its a good way to burn off some of that rowdy boy energy! So last night after I got home from work, I was in our bathroom taking my makeup off, getting comfy. Of course, my Little shadow followed me in and proceeded to entertain himself. He LOVES getting into Daddy's cupboard of the vanity and making a mess. His toy of choice last night was an un-opened bar of soap. He held it in his two little hands and it instantly transformed into an airplane. He was "flying" it all around, making a very cute airplane sound (how do little boys just KNOW this stuff?) and I was able to watch him without him knowing it for a couple of minutes. Then, his spidey-senses kicked in, he felt me watching him and made eye-contact with my reflection in the mirror. He gave me the cutest, most sheepish smile ever and then was off....... to find something else entertaining. Its amazing to see him begin to pretend and I'm learning that its one of the many gifts of "Mommyhood" to get to watch your child play when they don't know you're looking! Well, this Halloween was decidely more fun than last...... last year Jaydan had bronchitis, HATED his costume and didn't really "get" any of it. 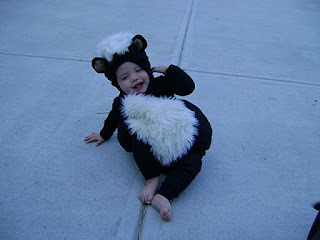 This year he loved his skunk costume, trick-or- treated a couple of the neighbor's houses and had lots of fun. He woke up in a terrible mood but his morning nap fixed that. We had lunch with our first babysitter, Ms. Allison and her daughter Savannah at Chuck E. Cheese. It was the first time we've gone since he was a tiny baby and it was fun to see him enjoy all of the exciting things for kids to do. We then swung by Daddy's work and said hi to him and some co-workers. We hit a bumpy patch at dinner, which nearly caused Jaydan to have to go to bed without trick or treating, but a brief time out seemed to tune him up. We got his costume on and set out at about 7 o'clock. We couldn't quite get "trick or treat" down before we disembarked, so we settled for "Heeth" (please) and the neighbors seemed to think that was close enough. He got multiple treats from each house because they would hand him one, he would throw it in his bucket and then reach for another from theirs! Our neighborhood was sadly quiet, we probably got 10 trick-or-treaters, but I did meet some new neighbors and we've already decided to do a block party or something next year to liven things up!! Jaydan and I traveled to Montgomery, AL (land of tornadoes and duct tape) Friday night after work. It was raining, traffic was horrendous and we got there much later than we planned....but once we got there we had lots of fun. We went to spend one last weekend w/ my BFF, Jill and Jaydan's BFF, Gavin. We t ook the kids to the Montgomery Zoo (fun was had by all), the kids played and Jilly and I chatted and enjoyed being together. The parting on Sunday was bitter sweet. Jilly and her family are moving to Japan for FOUR years courtesy of the U.S. Airforce. I am so excited for them and their new adventure but also completely heartbroken that it will take them so far away for so long. I am planning on making a trip over there at least once during their tour and Jill has committed to coming home at L EAST once a year. Jill and I have only known each other about 4 years, but we have been through a lot together including being pregnant at the same time. She got in her car, drove 6 hours and left two month old Gavin overnight to be with me when I was in labor and she knew my Mom couldn't make it in time (only to have me kick her out of the room almost as soon as she got there). I was her surrogate husband when her real husband was in Iraq for the ma jority of her pregnancy (it wasn't easy, she was crazy most of the time). She has filled the large hole that being so far from my friends and family leaves in my heart and honestly I don't know how I will cope without her. Hobbies, we love you and will miss you more than you know. Have a safe journey filled with many new and exciting adventures...... and then hurry home to those of us that will miss you so much! To my "Dear Old Dad"! Your wisdom and big heart are truly an inspiration and I am so thankful for you. 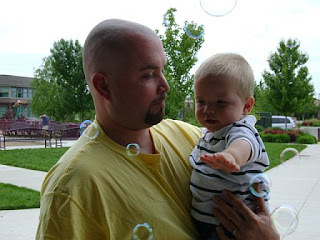 Tyson and I are lucky to have you as a Dad and now our kids are even more blessed to have you as a Gum-paw. May this year offer all of the blessings you deserve! We had a very busy, very fun weekend. 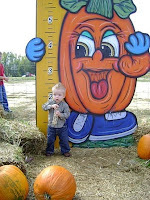 Saturday I took Jaydan to our local Pumpkin Patch. 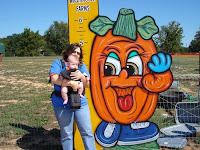 We went last year and he was way too small to enjoy most of the fun stuff, but we saw the potential for fun as he grows so we knew a tradition was born. Sadly, our Daddy had to work so we went without him! It was so much more fun this year. 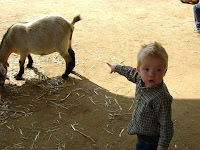 Jaydan really enjoyed the petting zoo, and cow-train ride. He was able to run around and get some exercise and get dirty. There were several exclamations of "Wow" upon seeing the different animals and he was so excited to see the "duts" (turkeys and a peacock). I hope that someday we will be able to convince him that all birds are NOT ducks, but right now he's n ot buying it. I couldn't resist doing a picture comparison. My what a difference a year makes! I'm sure next year will be even more fun and we will be able to enjoy even more of the activities. We came home that night and carved our pumpkin. Well, I carved it, Jaydan played with and tried to eat the guts! 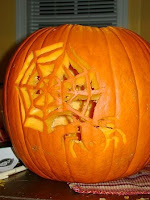 It turned out pretty cool..... you should run out and but a pumpkin carving kit. I am SO not artistic and if I can do this, just think of the cool things you can do if you have a modicum of talent. It was our first real snap of fall weather, it was cold enough Sunday morning to provide an excuse to build the season's first fire. That sparked (ha ha) a whole new reason for "No, nos", but it added to the fall-y festive mood! This is the new ride. 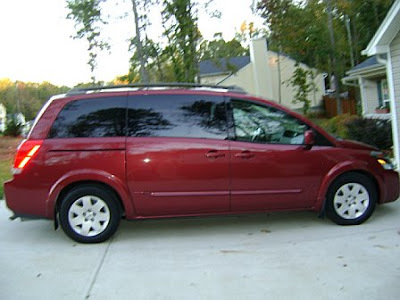 Its a minivan, but its still a little cool, right? This is how we spent Sunday. Last time we bought a car, Jaydan was two months old...... lets suffice it to say that things didn't go AS smoothly this time :) This car is new to us, had low miles and was very well taken care of..... AND it had an automatic sliding door, which is sooooooo nice when you have your arms full of kicking and screaming toddler, this I know for a fact. You see, Jaydan did his best to make sure that all of the amenities would work for our family. He did enjoy that there is so much space....he explored every square inch before giving his approval. He even figured out how to turn the stereo on and then proceeded to show the salesman how well he dances! I'm home with Jaydan today, who is under the weather. I think its just a bad cold, but he was up all night off and on, which lead me to believe that it was worse than it actually is. We had a great weekend with Jeff's family.....his sisters and their kids were up from Enterprise, Alabama. For the first time Jaydan was old enough to sort of play with his cousins so that was fun. 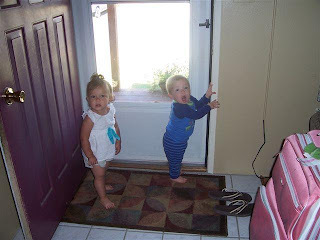 He chased his cousin, Lindsey around Nana's house for a good hour yelling "Woo woo woo". Not sure what that means, but they both thought it was big fun. This is a picture that I promised my mom I would post. Jaydan picked this up at the grocery store last week and proceeded to wear it the rest of the shopping trip..... this, from the kid who won't keep a hat on his head, ever. He held very still, so as not to lose it and grinned from ear to ear. He doesn't consistently keep in on anymore, but this particular story-time called for it! It was another great weekend that went all too fast. Jaydan and I ran errands Saturday morning while Daddy was at work and then we all loaded up that evening and went to spend the night with Jeff's parents. His cousin and his girlfriend were there so it was fun to meet some new family. Its still pretty still on the homefront......except for a gas shortage that is making life in Metro Atlanta very unpleasant. Winder, the town we live in has literally been without gas for a week and a half now. I learned my lesson the hard way, (i.e. driving around for an hour with a tired, hungry, cranky kid) and have been filling up anywhere I can find it since almost two weeks ago, sometimes to the tune of nearly $5 a gallon. Needless to say, with a three hour a day commute....... this is cause for concern. Our local government keeps promising relief "in a few days", which is now going on three weeks. We are all praying to catch a break and who knows......if it gets bad enough, rumor has it the Governor is thinking about granting a state-wide paid-day-off! Tagged - Thank you Sunny! 1. I'm in bed EVERY night by 9:30. Period. 2. I work under the first African American, FEMALE Chief Justice of the Supreme Court of Georgia. 3. I LOVE McDonalds. Really. 4. My best friend (south of the Mason-Dixon line) is moving to Japan next month......for 4 years. 5. I secretly miss Idaho. 6. I can burp like a truck driver. 7. I LOVE Jack Daniels. 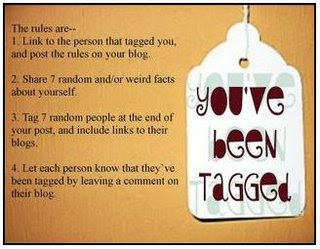 I don't think I have any friends that haven't already been tagged! Things have been pretty quiet at the Little house this week...... oh, do you ever get the feeling you just jinxed yourself? Basically I have nothing major to report...... Jaydan got his first time-out at daycare yesterday, but the only thing that surprised me about that was that it was his first?!? 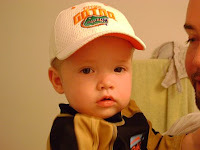 Basically I'm adding this post so I can have an excuse to add these pictures of our Little man in his Gator Gear. 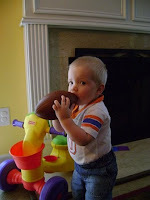 For those of you who aren't from the South...... college football here is like a religion and the fans are rabid.We began the brainwashing before he was ever born by painting his room in Florida's orange and blue..... and, as you can see, its paying off! Go Gators! 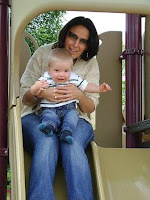 As the Mom of an almost-16-month-old, I'm only just beginning to realize the meaning of "out of the mouthes of babes". Tuesday, when I picked Jaydan up from daycare our beloved Ms. Kate said, "Jaydan, show Mama what you learned today" and raised her arms above her head. My sweet baby boy threw his little arms up and said, "Halalalauah"...... it wasn't perfect, but it was a very close (and oh-so-cute) imitation of her "Hallelujah". It melted my heart and made me think..... we really probably should get this kid in a church somewhere. The other significant thing that happened this weekend, was that my husband lost my cell phone. Technically, he put it on top of my car (don't ask) and I drove off with it up here, so, as he informs me, it was a joint effort. I spent 2 1/2 hours on Saturday beating the bush on the side of the highway looking for it. I prayed.....literally, "God, if you'll let me find my phone, I promise I will get into a church". Viola..... next morning I called my phone and the neighbor answered. He had found it on his morning walk. These two forces combined and resulted in Jaydan and I heading into Winder for church. Jeff was raised Methodist, which is somewhat important to him so we found a Methodist Church with a contemporary service......more my speed. I enjoyed it, Jaydan enjoyed it and we'll be back...... Hallelujah. So Jaydan's week got off to a rough start, in the form of shots on Monday. He's getting to an age now where he's retaining some stuff, so....... the first shot surprised him and protested by screaming bloody murder. He was so busy screaming about the first one that the second one snuck up on him. She came back a third time, to put bandages on and he was like "Oh, Hell No" and put up a fight, shoving her hands away. I'm pretty sure that two shots in our new limit. He also fought poor Dr. Schlossberg, biting the tongue compressor when he tried to look in his mouth. Doc decided it wasn't THAT important to see those new teeth..... I THINK he has a new big tooth in the back this week, but I'm not sure because he's decided that people looking in his mouth is a very bad thing. That same night I grilled out and let him play in the back yard while I was cooking. A mosquito bit his forehead...... I put some cortizone cream on it and didn't think too much of it. Jeff commented that it was a nasty bite the next morning after he dropped him off. When I picked him up that night he looked like a fetal alcohol syndrome baby. He had a huge goose egg on his forehead, the bridge of his nose was swollen almost flat and his right eye was all puffed up. Naturally, I called Doc and he said give him some benadryl and keep doing the cortizone cream and it should look better in a few days! It DID look better yesterday but the swelling is moving to the other side. All of this, AND the mystery tooth and no one is sure exists...... its not easy being the Fatty Pigger this week. We had a wonderful, but busy weekend. Our Super-Daddy bought us all tickets to see "Elmo Live" at Philips Arena on Saturday. We had been talking about going, but weren't sure if Jaydan was old enough to enjoy it (and justify the money) yet. On Friday, Jeff took the plunge and got tickets and I have to say it was money well spent. Jaydan had his own seat and we pushed it up, so he had his own little dance floor and boy did he work it. I would say for the first half hour or so he stood there, hanging on to the seat in front of him and CUT A RUG. He danced and sang, clapped and shouted with joy! It was sooooo too cute. Even after he kind of lost interest in the show, he was fascinated with all of the kids. There is no price tag you can put on seeing your kids face light up like that. Sunday, we went to Jeff's parents house. Nana has been feeding some ducks in her back yard so they are pretty tame and come right up to you when you feed them (they take food from her hand). So, Jaydan got to feed the ducks. Again with the cuteness, he would stand there with a chip in his little hand and look at the duck and say "heeth, heeth,", which translates to "please, please". At one point they got a little close for comfort and one even pecked his fat little foot a couple of times. After a few initial howls of indignation he was right back at it. "Heeth, heeth". I am seeing a lot of people reminiscing about where they were or what they were doing on September 11, 2001...... the day New York, The United States and the World changed.. I was home sick in bed. I remember my roomate and best friend Holly running into my room telling me to turn on the TV there was a plane wreck in New York and things were exploding and "they think this might be a big deal". There was so much chaos for so much of that day...... it was so hard to make sense of what was happening...... hard to believe that someone would actually do something like this on purpose.....and hard to image how many people's lives were changing, in a big way, right before our eyes. I was 23 years old and had never experienced anything like that (and haven't since..... hope to never again). My most profound memory of that day is seeing the shape of a plane punched out of the second tower..... it was like someone had taken a cookie cutter to the side of a BUILDING and no matter how deep the denial, at that point there wasn't much question of what was going on. I went back to work the next day at PAML (boy, I hated that job) and I remember portable TV's set up in every break room and thats where we all sat in silence and watched what was still unfolding in New York. I can honestly say that that day had more impact on my life than any other day, ever and I really believe that life as an American will never be the same. I remember such a surge of patriotism.......an almost fierce pride in being an American...............and the strongest sense of community I have ever experienced. For once Americans truly were United like only a tragedy can bring people together. Sadly, I think we've lost sight of that since and I can only hope that the "Powers that be" took something genuine with them from that day...... and that all of those lives weren't lost in vain. My boys made it home yesterday. It was wonderful to lay eyes and lips on my Little guy...... I swear he's changed even in the few days they've been gone. He also came back with a cold, I think..... either that or he's cutting some whopper teeth. He's snotty and feverish and fussy, and its STILL great to have him home. My boys took a little Man-cation to Florida for a few days. I miss them terribly, BUT we've been at this long enough now that I can appreciate having some "Tori time". Saturday I painted Jaydan's bathroom..... I turned out so cute (I'll try to post pics) and watched football. Yesterday I did some big jobs around the house that are just impossible to get to with an active 15 month old (like cleaning the pantry). I know the rest of their trip will go fast b/c I'm back at work now. I also am so proud of Jeff, that he's the kind of Dad that is willing to take Jaydan on their own little adventure by himself. It's good for them to work things out together, on their own, without Mom's input. I know that things won't get done the way I would do them....... and even though that drives me crazy, really, its ok. I enjoyed my nice, quiet weekend and now I'm looking forward to getting them back home. Our trip to Idaho was wonderful, as usual. It was a busy one, with wedding stuff but we got to spend lots of QT w/ friends and family. Jaydan and Jazzy are beginning to have mini-power struggles, which I'm sure there is more of to come...... but it is so cute to watch them play and interact. 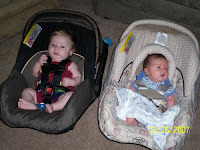 They seem to have a very special relationship and have since really early on....... during our first trip, Jaydan was only 4 months old and Jazzy would get very distressed to hear him cry or fuss. They are pretty in-tune to each other and I look forward to watching them grow up together.